By Melissa Lennig on November 16, 2018 Leave a Comment. This content contains affiliate links. As an Amazon Associate I earn from qualifying purchases. 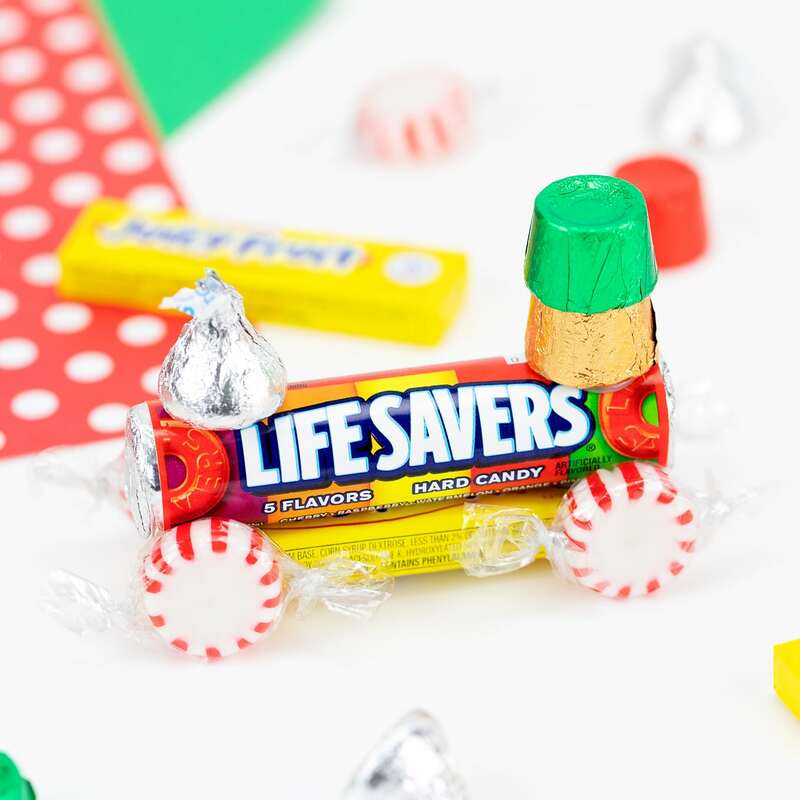 In this easy step-by-step tutorial and video, learn how to make a classic Candy Train from Life Savers, peppermints, Hershey’s Kisses, and more. This fun Christmas craft is easy for kids to make at school, holiday parties, birthday parties, and home. It looks so cute hanging from Christmas trees and gifts! Yup. That happens around day two here. Mostly I just let them be bored, but I do have a couple easy holiday crafts up my sleeve for this week. 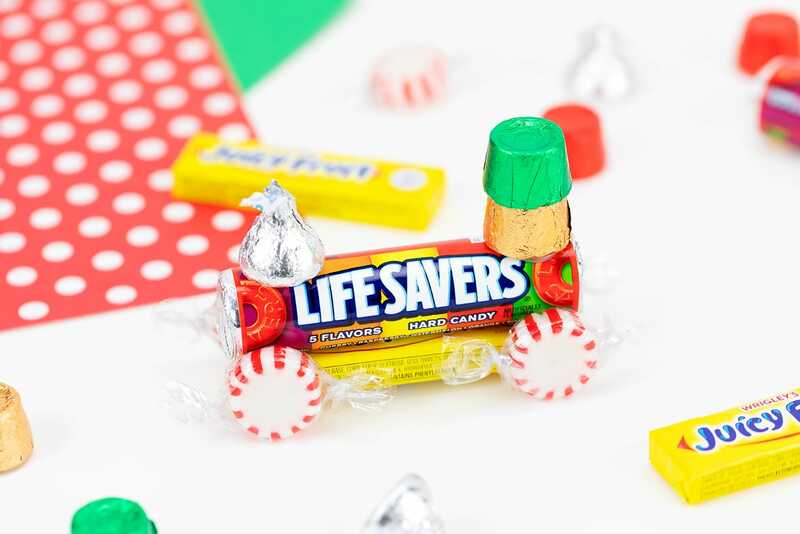 Shared below is one of my favorites, classic candy trains. To make this blast from the past, head to your local dollar store for supplies or order in bulk through the links below. 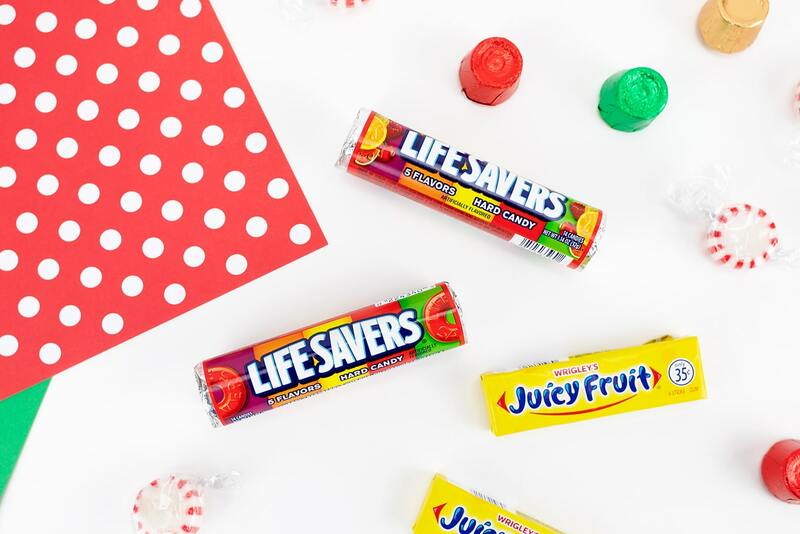 You can also find classic rainbow Life Savers inside of the Life Savers Storybooks located in the holiday section of major stores. I like to put all of the candy in little paper cups so kids can work independently! 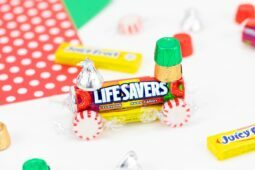 Learn how to make a classic Candy Train from Life Savers, peppermints, Hershey’s Kisses, and more. This adorable Christmas craft is fun for kids to make with friends at school, birthday parties, or home, and looks adorable hanging from the Christmas tree! 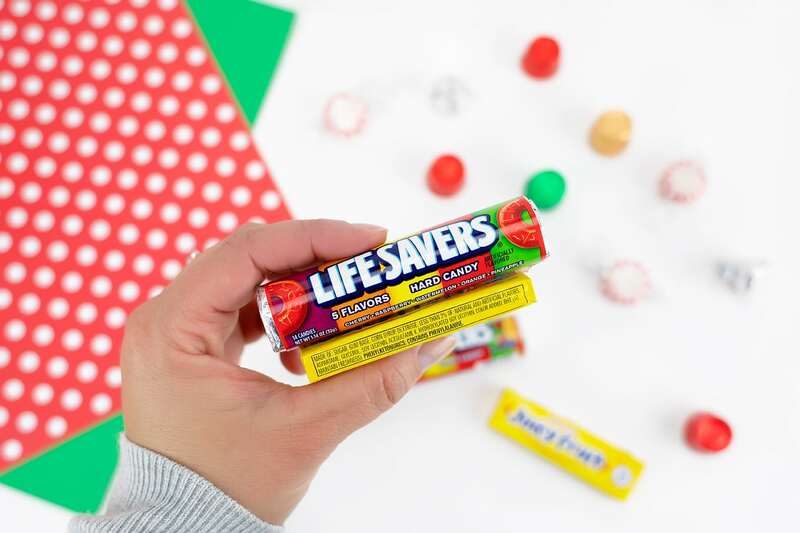 Use a low-temperature glue gun to glue the Life Savers roll to the gum. Next, glue one Hershey’s Kiss and two Rolos to the top of the Life Savers roll. Last, glue four peppermint candies to the gum (two on each side of the gum). 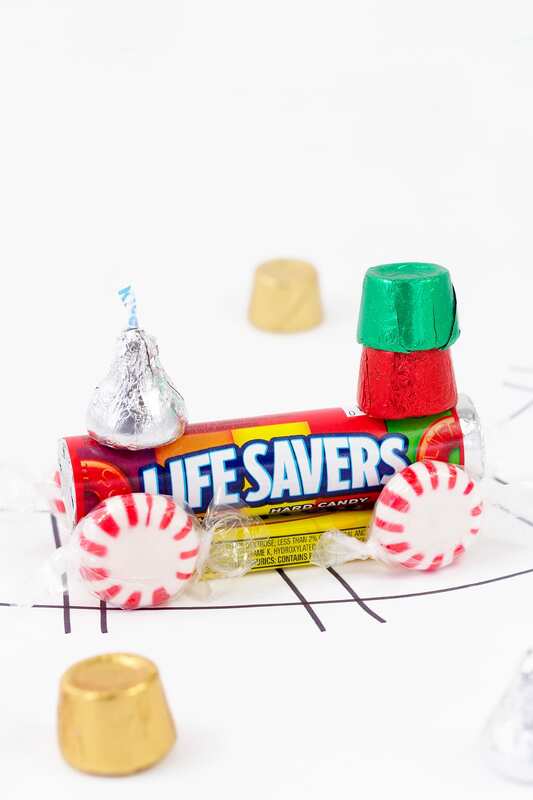 If desired, secure ribbon to the top of the candy train to make it an ornament. 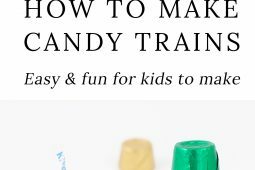 Your easy and fun candy train is complete! 1. Use a low-temperature glue gun to glue the Life Savers to the gum. There is a handy red stripe on the roll of Life Savers that kids can use as a guide. Tip: Use Glue Dots if your child is too young to handle a hot glue gun. 2. Next, glue a Hershey’s Kiss and two Rolos to the top of the Life Savers. 3. Last, glue four peppermint candies to the gum (two on each side of the gum). 4. If desired, secure curling ribbon or gold string to the top of the train so it can be used as an ornament. 5. 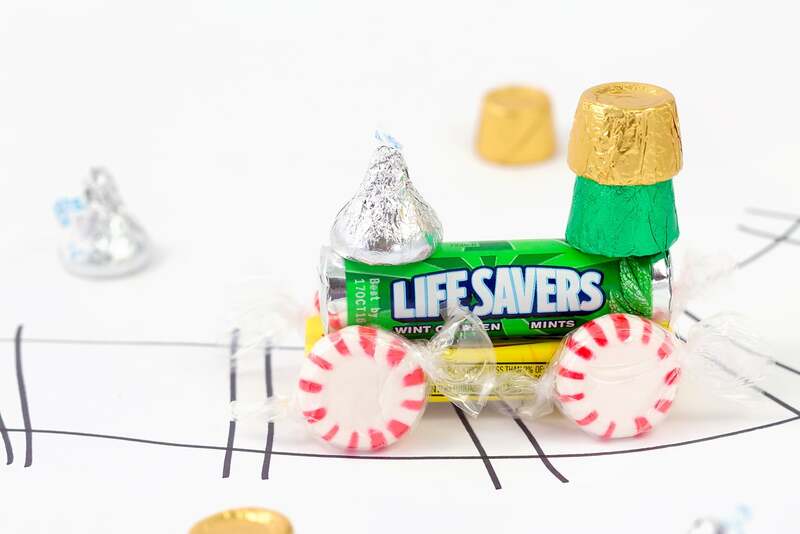 Your cute DIY candy train is complete! 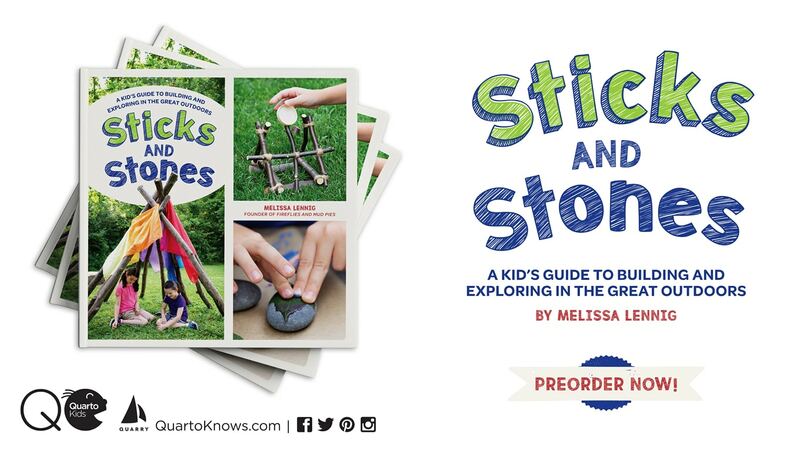 Easy peasy, and kids love it! They can even make a cargo car with just the gum and mints for their train to pull! This post was originally published December 20, 2015.